Bill Breedlove Reading at Tuesday Funk! The very fine folks at the hugely awesome Tuesday Funk show have invited me to join their July lineup, along with Daniel Kraus, Kendra Stevens, Eden M. Robins, and Andrew Huff. 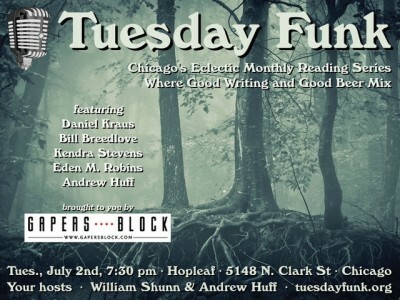 Considering that the series’ tagline is “Chicago’s Eclectic Monthly Reading Series Where Good Writing and Good Beer Mix,” I think you know what you will be in for that evening. Since the venue is the justifiably world-famous Hopleaf Bar in lovely Andersonville, you will be guaranteed of at least all of the good beer you can handle. The fun starts Tuesday 2 July, at 7:30pm. And admission is FREE. Hope to see y’all there. My latest book review is up at Metazen. I am horribly late in posting this here, but I have been doing some book reviews for the good folks over at Metazen. I recently had the opportunity to review Stewart Home’s latest, MANDY, CHARLIE & MARY-JANE. This was definitely not one’s average reading experience. You can check out the review here, and in the future I will try and get these posted promptly. Hope y’all are having a great summer so far. A very kind review of HOW TO DIE WELL from Horror Fiction Review! Horror Fiction Review is a great site for checking out just about every book of interest in the horror field. They do a ton of reviews every month, and the reviewers are devoted lovers of all things scary, creepy, grotesque, and bizarro, so you know you are getting the straight dope. That being said, I was extremely honored and humbled to see that in their June reviews, HOW TO DIE WELL was given a very nice write-up. The reviewer said many wonderful things, all of which I am too shy to repeat, but you can read for yourself right here. Thank you very kindly, Horror Fiction Review!